One of the most complex and perilous issue facing Mexico-US relations in the twenty-first century are the treacherous drug cartels, corrupting every aspect of day-to-day life in border cities like Tijuana and Juarez, and the intricate infiltration of these cartels by FBI agents. This complicated issue is incredibly difficult to grasp, let alone to translate onto the big screen. French-Canadian director Denis Villeneuve has attempted to do the issue justice in his latest thriller Sicario, presenting us with a story that criticises and sympathises with both sides of the border. It opens with a wide-angle shot of a desolated Tex-Mex suburb, as a group of FBI enforcers converge upon a single house—one that looks like any other. But as we soon find out, it’s anything but. The world of Sicario is an ambiguous one where anything could pose as a threat and there’s no certainty that it won’t become a threat in the future. FBI narcotics agent Kate Macer (Emily Blunt) sees that she isn’t doing enough to stop the influx of drugs over the border by performing single raids, so along with her partner Reggie (Daniel Kaluuya), attempts to make a big dint in the cartel by going deep inside agency operations. She is also forced to work with two officials, Matt (Josh Brolin) and Alejandro (Benicio Del Toro), whom she cannot be sure she can trust. 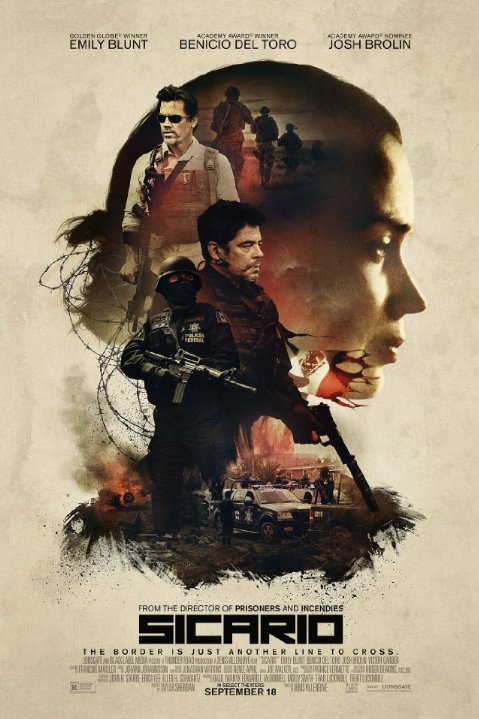 After making Prisoners and Enemy, two of most original and gripping thrillers in recent times, Sicario is the next evolutionary step for Villeneuve: something more than just a pure good-guy-catches-bad-guy flick. Sicario is far more complicated than the average thriller presenting characters with no certain moral compass and skewed motivations. The only person we know we can trust is Kate, but soon she is forced to make morally compromising choices in order to advance the fight. Often the audience is asked to question what we do in her situation, and more often than not our own moral compasses would sway towards something more immoral and insidious. Blunt proves with Sicario that’s she’s not just an actress fit for rom-coms and period dramas. She is playing against her type here, with a performance that is brave and physically and emotionally grueling. She has made Kate an all-together sympathetic character, mixing vulnerability with confidence. It’s one of the best performances of the year so far. Brolin isn’t given much to work with in his character of a would-be CIA agent; he plays it laconic and a little too relaxed. Del Toro on the other hand hasn’t been this good since 21 Grams; his character Alejandro is maybe a good guy or maybe a bad guy, and even at the film’s end you’re not sure which one he is. Roger Deakin’s cinematography is, as always, incredible and hauntingly expressive, filling the screens with vast deserts, grimy border towns and seedy neon signs. The landscape becomes a character in and of itself. The screenplay (by actor-turned-writer Taylor Sheridan, who recently revealed that he was pressured by producers to change Blunt’s character to male) is intricate and tense, with convincingly-motivated characters. He gives Del Toro all the best lines, which he delivers with aplomb. Inspiration for the film seems to have come from a number of places; the film is a mixture of No Country For Old Men, The Silence of the Lambs and Zero Dark Thirty, sharing many narrative and visual choices with those films. Sicario is a masterfully directed and written thriller. It’s so good, there’s already a sequel in the works. The film is intricate, polished and impeccably led by gut-wrenching performances from Blunt and Del Toro. Rather than taking sides on the issue, it presents the US and Mexico in both a positive and negative light that provides a balance for the audience to make their own mind up about the more unscrupulous facets surrounding the issue. It’s gripping, complex and beautifully miserable until the very end.